In the Christmas classic It’s a Wonderful Life a small depositor-owned building and loan association managed by George Bailey (Jimmy Stewart) has to compete with a large commercial bank owned by a ruthless manipulator and developer who stops at nothing to maximize his profits at the expense of local residents. In recent years, as large commercial banks and investment institutions put the squeeze on mutual savings banks, there are fewer financial resources available for communities, small businesses and consumers, and what is available comes at a steep price to borrowers and debtors. A partial remedy and some relief from crushing debt may become available to struggling borrowers and small businesses in New Jersey with a change in administration. On January 16 Democrat Phil Murphy, a former Wall Street executive and ambassador to Germany under President Obama, was inaugurated Governor of New Jersey, succeeding Republican Chris Christie. Throughout his campaign Murphy emphasized themes popular among progressives in this deep-blue state. To help restore fairness for everyone, Murphy said the state minimum wage must go up, student loan programs revamped, and tax breaks for the working poor should be expanded. But his most noteworthy proposal was a call for the creation of a state-owned public bank that would allow college students and small businesses to access loans at more equitable rates than those charged by profit-driven commercial institutions. Only one other state, North Dakota, currently operates such a bank. The prospect of a state bank is enthusiastically supported by consumer advocates, who see it as a way to repatriate more than $1 billion a year and put it to work financing small-scale public infrastructure projects, making lower-interest student loans and small business loans. They have embraced the idea of creating this public bank to invest state deposits in New Jersey’s communities rather than shipping the capital off to banks in other states or overseas for foreign investment. It would act as a partner to local banks and credit unions and not as a competitor, Murphy has said. Under the Codey-Gill proposal, all public entities in New Jersey would be able to use the state-run bank. It would provide transportation project loans, student loans, small business loans, and be able to purchase mortgages from commercial banks. The bank would also be able to purchase, lease and construct buildings, and would even have the power of eminent domain. And it would be able to buy and sell federal funds. The 13-member board of directors would appoint a president and determine his or her salary. Six of the directors would be appointed by the governor, including four with respective experience in banking administration, credit union administration, consumer financial advocacy and public administration. Two picks would be recommended by the Senate president, two by the Assembly speaker, and one each by the Assembly and Senate minority leaders. The state treasurer would serve as the 13th member. The state auditor would be required to hire an independent financial firm to examine the bank once a year and to prepare a report. 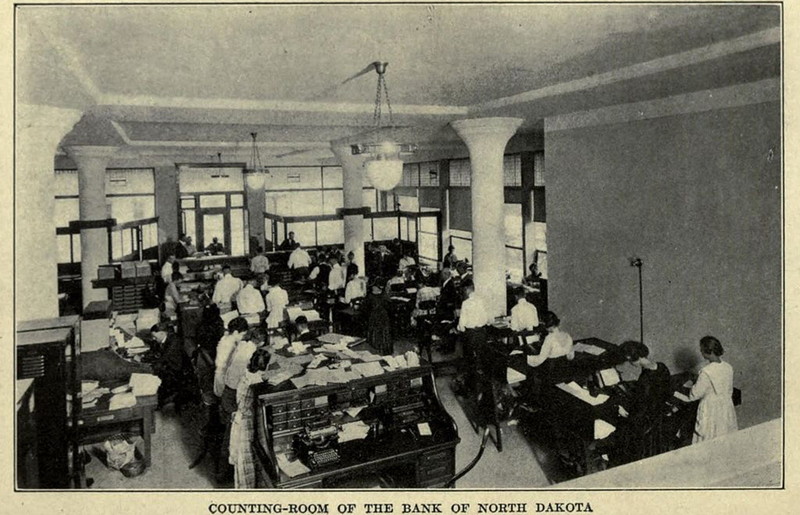 The only state-owned bank in existence is the Bank of North Dakota, which was created by the state legislature nearly 100 years ago because of the belief that North Dakota’s farmers were being exploited by high interest rates. Since 9 of 10 North Dakotans were farmers, this issue galvanized voters and lawmakers. The Bank’s primary service is to support North Dakota’s financial institutions and state agencies. In those situations where it deals directly with North Dakota residents, it fills a need that is underserved and for which the private sector has requested its involvement, such as loans for redevelopment and rural mortgages. If implemented, a publicly owned Bank of New Jersey may play a role similar to that of Bailey Building and Loan in It’s a Wonderful Life by leveraging state tax deposits to provide low-cost loans to homeowners, students and small businesses. Despite concerns alleged by banking industry lobbyists, a state bank might actually benefit the industry by partnering with small community banks to originate and service these loans. Across the country, in California, legislators are also discussing the formation of a state bank in order to receive deposits and handle transactions from the huge marijuana industry. That industry has been unable to use commercial banks for fear of federal sanction, since U.S. law still criminalizes weed. Banking reform activists have also pointed out that interest on public bonds for education, transportation and roads, housing and other worthy purposes often flows to Wall Street, and such projects would be better financed by a state or even a municipally owned bank. Lawmakers and activists in every other state will have these and other reasons to look into establishing state banks. This is a movement that bears watching. Eric A. Gordon contributed to this article.